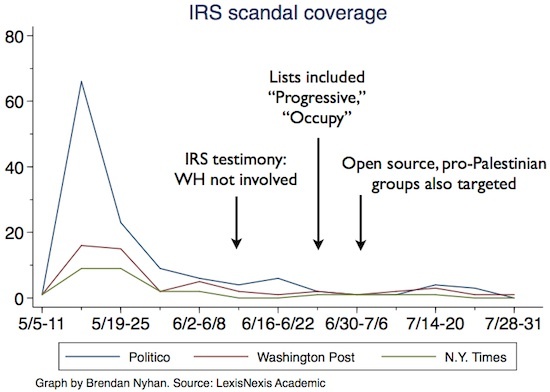 The arc of a scandal is short and bends toward distraction, according to Dartmouth political scientist Brendan Nyhan, who analyzed the media's coverage of the IRS scandal and found that despite enormous amounts of initial interest and attention, coverage died out almost immediately, even as new data emerged that contradicted earlier assumptions put forward by the mainstream press. "The problem" with this high peak and long tail of coverage, he writes in the Columbia Journalism Review, "is that it often takes time for the full set of facts to come out. By that time, the story is old news and the more complex or ambiguous details that often emerge are buried or ignored." In other words, news consumers get plenty of the initial coverage -- which proved to be largely off base -- but little of the corrective coverage that emerges later on. So readers might have missed the fact that progressive groups were also targeted, that nonpartisan groups were targeted, that many of the IRS officials involved were actually self-described Republican, and so on. "With so little prominent coverage after the full facts of the case became clear, is it any wonder that members of the public might still be confused?" Nyhan asks. Indeed, a CNN poll in mid-June found that nearly half of Americans erroneously believed that the White House ordered IRS targeting of Tea Party groups, up 10 percentage points from the previous month. There is no evidence that the White House was involved in the screening of nonprofit political groups, and every IRS employee who has spoken with congressional investigators has said the White House was not, but mainstream, nonpartisan news anchors and journalists assumed from the beginning that the scandal was "a Nixonian-type tactic," as NBC reported the same day news of the targeting broke.